Celia Hempton, Stromboli, 900 Metres, 5th July 2017, 72x85 cm. The painter Celia Hempton (b. 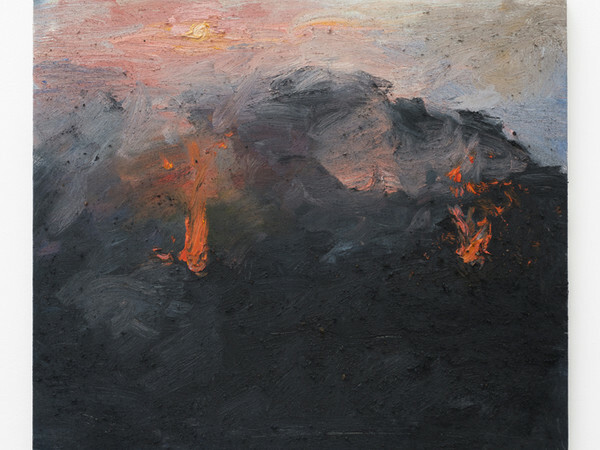 1981 UK) presents two groups of new paintings in her second show at the gallery: landscapes made at the summit of the active Sicilian volcano of Stromboli, and paintings made from live video streams of hacked surveillance cameras around the world. Celia Hempton lives and works in London. After studying at Glasgow School of Art, she graduated from the Royal College of Art in 2007. She spent two years at the British School in Rome, and her first exhibition in Italy was at Galleria Lorcan O’Neill in 2014. The same year she participated in the Gwangju Biennale. Recent presentations of her work have been at the Serpentine Gallery in London; La Casa Encendida, Madrid; the David Roberts Art Foundation, London; the Confort Moderne art center in Poitiers; the Museo de Arte Moderno, Medellín; and the Institute of Contemporary Art, Boston.